This problem is caused by wrong firewall or router settings in 99% of all cases! Most routers have a web interface which can be accessed with your browser. A common address for it is http://192.168.0.1 or https://192.168.0.1. However there are many routers which use other addresses. Please check the manual of your router for details. Contact the person who setup your router/internet if you need login data (or check the manual for defaults). What you have to setup is port-forwarding. CS2D uses the UDP protcol and UDP Port 36963. Note that 36963 is the default port, you can also define another port in the server settings. Of course you always have to forward the port you defined in the settings. As alternative you can activate the DMZ Host option if you don't manage to setup port-forwarding properly. However this is a security risk and not recommended unless you are using a good software firewall. Make sure your firewall allows CS2D to access the internet! 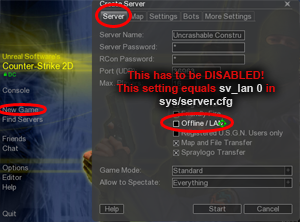 You have to grant full internet access (incoming and outgoing) for your CS2D binary: CS2D(.exe) when using the client or cs2d_dedicated(.exe) when using the dedicated server program. Also - if possible - allow all traffic on UDP Port 36963 (or the port you chose in the server settings)! For Windows users: Make sure that Windows Firewall doesn't block CS2D! Read the Windows Firewall article at Wikipedia! Read this guide/checklist if you still have problems! ATTENTION: Testing from within the same network might fail! It is possible that people from within the same network/internet connection (e.g. 2 PCs connected to the same router, one hosting, other one viewing the serverlist) can't see each other. This does NOT mean, that nobody sees your server! It can be caused by wrong router settings and many other things. It might work perfectly well for everyone outside your network! Please ask someone who is not using the same internect connection to check if he sees your server! Still having trouble? Please read "My server is not in the serverlist" as well!